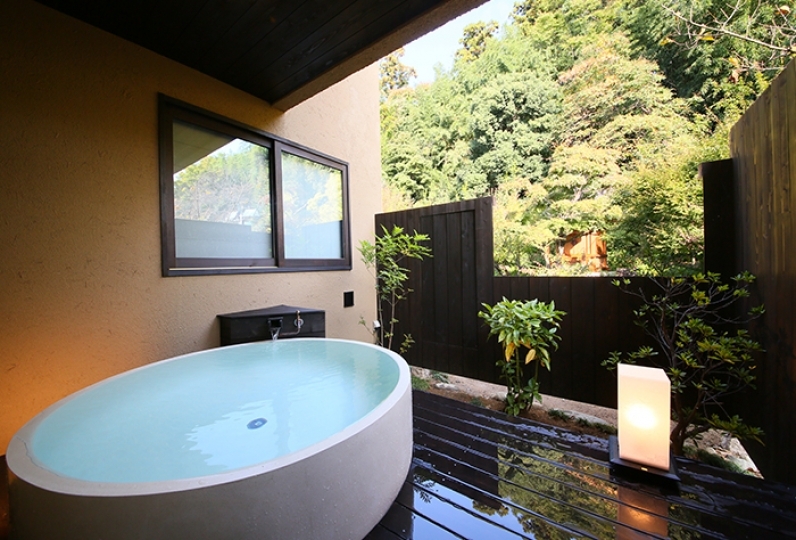 Tokiwa Hotel sits on 10,000 square meters of lush nature and welcomes you into Kofu with all its heart. When you walk in the separated corridor you'll experience the seasons and spirit of Japan. The carefully made sukiya-style buildings are lined up one by one. An extraordinary space made with traditional Japanese construction techniques that values the warmth of the tatami and wood. Centered around the courtyard is the east building with a view of the southern alps and the west building with a view of Mount Fuji. This layout will surely make you feel the Japanese atmosphere. 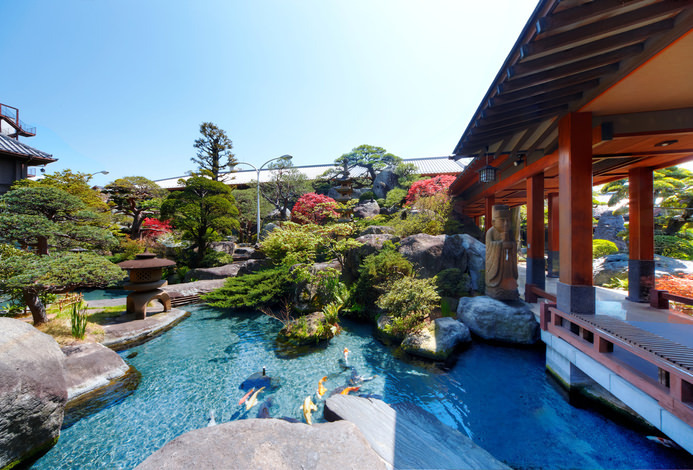 The hot spring opened in the 1200's and has a history as the hidden hot spring of Takeda Shingen. Warm yourself in the tasteful ambiance of black granite, spacious bathtubs, and large windows. Developed over 80 years, our meals are focused on the much loved taste of Koshu cuisine. The marbled Koshu beef from Yamanashi and Koshu wine fed pork have a strong umami flavor. 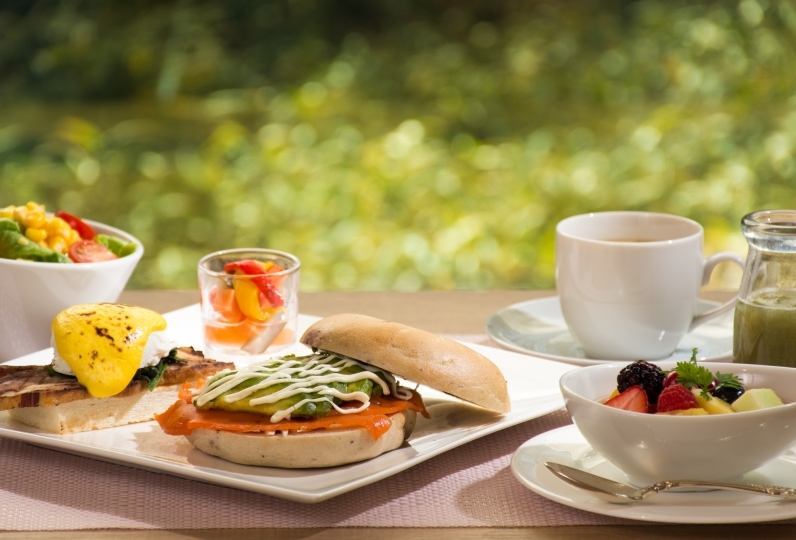 Our chef creates dishes which you can not only taste but also visually enjoy. 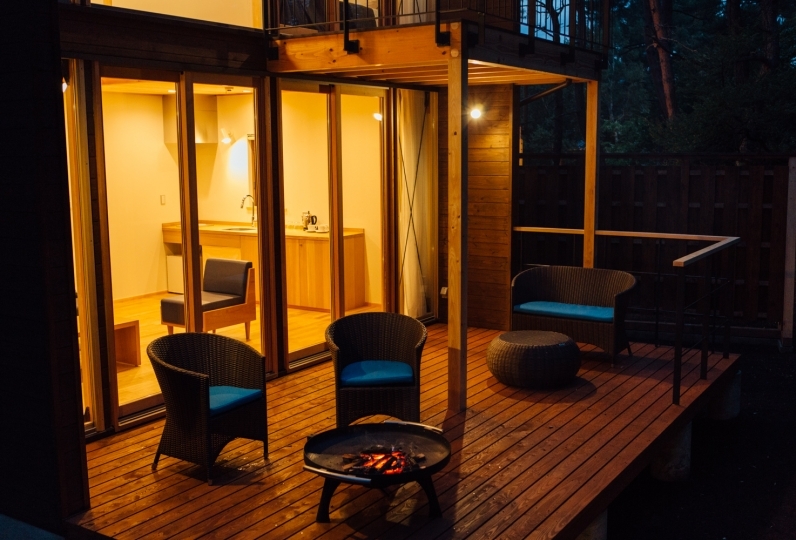 Take a train or car and make your way to Tokiwa Hotel. 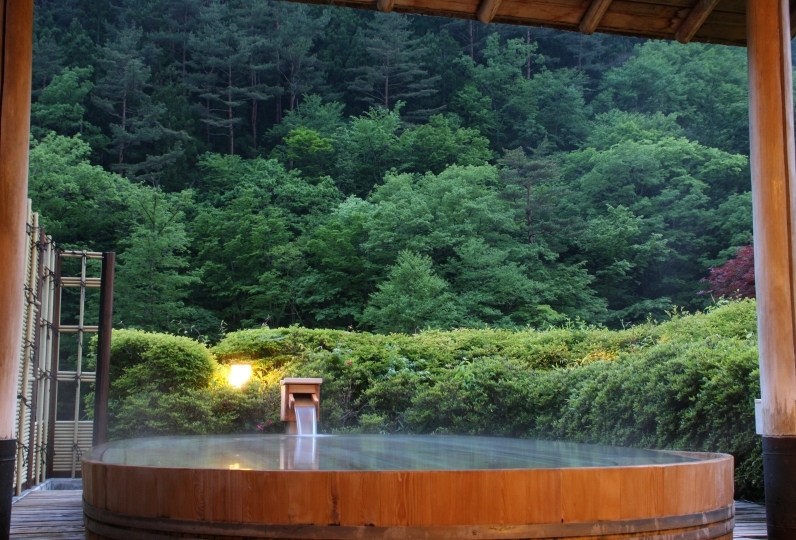 Take a high-quality journey with Japanese undertones and enjoy the charm of Kofu. Thank you very much for providing a very nice room specially for the birthday and the anniversary of the 5th anniversary. It was a dream time for us who love to take a walk from the garden on a regular basis. Needless to say, the garden was very wonderful, but when the lights of the room were turned off at night, I experienced for the first time a shadow picture of a garden projected on a window with a window and a window with a round window. That was fantastic and very tasteful. I was very surprised that the incense burner was decorated because I like the incense, but I took the sara incense I brought and listened to the sound of the water and the birds flowing while being wrapped in the scent of agarwood, Two people enjoyed that the same garden showed various changes with the flow of time. The time to admire the garden while relaxing at the wet edge was exceptional. Thank you very much for the day you never experienced elsewhere. For us both, I think it will be a lifetime of memories. Also, when our employees greet you as they passed by, or when they spoke, we stopped working alone and thanked everyone. I was very impressed by that attitude. It is a sight that can not be seen recently even in famous ryokans and hotels. As well as wonderful gardens, rooms and buildings, we hope that you will leave great hospitality for future generations. Thank you very much for your valuable rooms, wonderful views and warm hospitality. I want her to go from before! I realized what I was saying. Destination with outdoor tastes the calm and calm of the room and the open air in time and space of their favorite themselves only a few times and has a well thoughtful dinner in a private room of adequate space We had delicious delicious food. I was worried about eating because I was another condition of her, but I was able to taste such a worry as going somewhere. I was able to get home while enjoying the returning autumn leaves full of very satisfied feelings, with a sense of tradition with a good sense of weight, a good staff response, a room bath meal a wonderful courtyard, and a good sense of tradition. I also want to make opportunities to look forward to visiting again. Very satisfied! If I have the opportunity I would like to stay again. Since opening in 1929, we've valued our connection with the locals and held a great number of meetings, weddings, and memorial services here. With 50 guest rooms in total we also come fully equipped with banquet halls. The Japanese-style banquet hall can accommodate up to 250 people, the Western-style banquet hall can accommodate up to 800 people standing and 500 seated. There are a variety of venues; five can be used for Western-style banquets and conferences, and six that can be used for Japanese-style banquets. With the garden surrounding the open air bath, you can experience the four seasons while you relax. The ladies hot spring has large windows that allow sunlight to pour in and the open air bath is made from fragrant cypress wood. The rest will rejuvenate you and make your body  and mind shine. The atrium has exposed beams that extend to the ceiling and is popular for wedding receptions and celebrations. 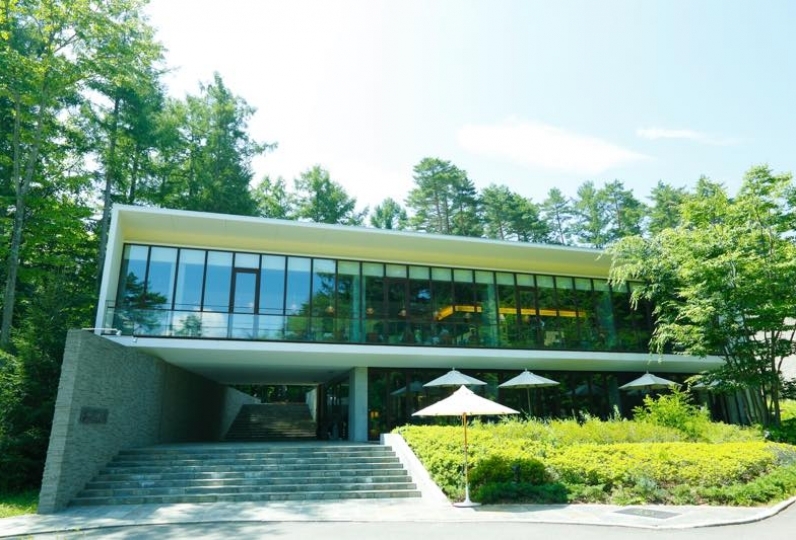 This elegant restaurant, nestled among a garden, was once an old Japanese-style house. Originally located in the Koshu countryside, this private residence of Yukari Takeda formally known as Hagiwara House, was dismantled and reconstructed here. This venue is perfect for small to medium sized dinner parties who want hospitality with a sense of privacy.